Controllable Players: Talent Moved to the National League? Talent Moved to the National League? The title really has nothing to do with this article. But after the movement of Greinke, Dempster, Pujols, and Fielder since last season, it's nice to see the AL get a little easier for the Blue Jays. This is a warning and a reminder to any Red Sox fans who might be encouraged by the recent salary mega-dump. The team will be worse next year. Adrian Gonzalez may have been past his peak but there are only a few first basemen around the league who are better than him and none of those will be playing for the Red Sox any time soon. There are positions that baseball fans don't mind seeing their team be weak at. Red Sox fans are more than familiar with that after watching every shortstop they've had since Nomar. First base is not one of those positions. When your first baseman isn't hitting 30 HR and smacking doubles all over the field, you notice. 260 million dollars is a lot of money. You as a fan will not see any of it. Ticket prices will not go down. Cable prices will not go down. You won't stop caring and watching every inning of your team play baseball. Take it from a fan who has watched a team that hasn't make the playoffs in 20 years, being a fan is a full time year round job with no breaks. The team may stop trying, but you don't get to. You're going to shell out your money to watch James Loney while all financial benefits of the trade go right into the owners pockets. I probably exaggerated on the last point. The Red Sox have shown a willingness to go out and spend money on elite players. After all, that's what it takes to get that sort of talent. Teams have become super aggressive about locking up their young players before they hit free agency. Since it's next to impossible for a team to grow their own elite players at every position, spending some money in free agency is the only option. Wouldn't it be great if the Red Sox could sign get a top first baseman now? I wonder what kind of contract it would take to get one. I'm thinking something around 7 years and $148 million. Don't worry, I'm sure there are some of those around baseball. Let's forget about Adrian Gonzalez though, he's gone. The money can be used to sign some of the homegrown players the Red Sox have developed in their system. Like Jacoby Ellsbury! He of the only 224 games played over the last 3 seasons. Carl Crawford had only two seasons under 150 games before signing with the Red Sox before he became an injury risk. Don't worry though, I'm sure Ellsbury will be fine over the minimum 6 year contract he's going to demand. And as a Boras client, he probably won't be looking at comparable outfielders when trying to determine the salary. You know, guys like Carl Crawford. The money could also be used for free agents though! Zack Greinke will be on the market and looking for a contract to make sure his great-great-great-great-grandchildren never have to work a day in their lives. I'm thinking he's going to be looking at the contracts just given to Cain and Hamels as the type of deal he wants. That could be money well spent though! There have never been questions about his makeup and his recent move back to the AL for a competitive team has been great so far. Also if Ellsbury leaves, I hear Nick Swisher is a free agent! At least the clubhouse atmosphere has been cleaned up. I was getting sick of how all those in-fighting stories were leading to incidents like Youkilis refusing to throw the ball to Gonzalez on grounders to third. This was probably something that couldn't have been solved by either firing the manager after the season or by just telling a bunch of millionaires to grow up. Free agent signings are inherently risky. You're putting a lot of money down on a human body which often isn't built to withstand the rigors of 162 games of baseball every year at the professional level. Since teams can control players for the start of their careers, free agents are often also heading into the downswing of their careers. Unfortunately for teams bidding on these players, that's just the way it's done. You can always choose to stay out of the free agent game completely, but if you have available money to spend, as the Red Sox do, the talent is worth high price. The Dodgers realized this and they looked around at the free agent marketplace and didn't like what they saw. 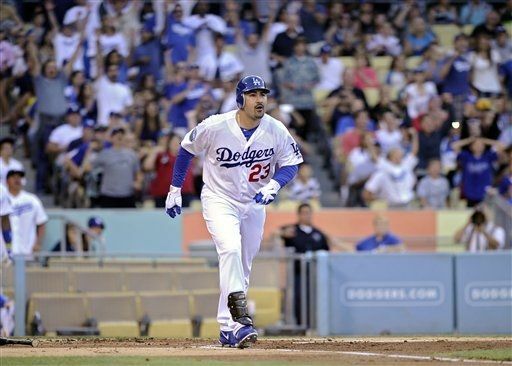 There's a reason they went after Adrian Gonzalez. He's expensive, but in their financial situation, it doesn't matter and he's exactly what they needed. Crawford may be a sunk cost, or maybe a year from now he'll become the Crawford from his Tampa days. Rich teams can afford to spend the time figuring that out. Just remember that any unspent money the Red Sox get out of this salary dump is pure profit for the owners. Maybe the prospects obtained in the trade will work out, although history in these sort of trades isn't on their side. It is good to see a team say they are refocusing on their minor league system. It is the most efficient way to develop a ball club. With a team like the Red Sox though, there's no real reason why they couldn't do that concurrently with taking chances on free agents. So Sox fans can take this as they will. This Jays fan though is relieved to see those guys out of the AL East.